When the sheets arrived the wrapping was 100% recyclable. No plastic in sight. That was the first thing I liked. The second thing I liked was when I washed them for the first time they were soft and cozy. I'm sure as I keep washing them they'll get that much more comfy and cozy. I'm picky about sheets but with these sheets I'll be buying another set real soon. 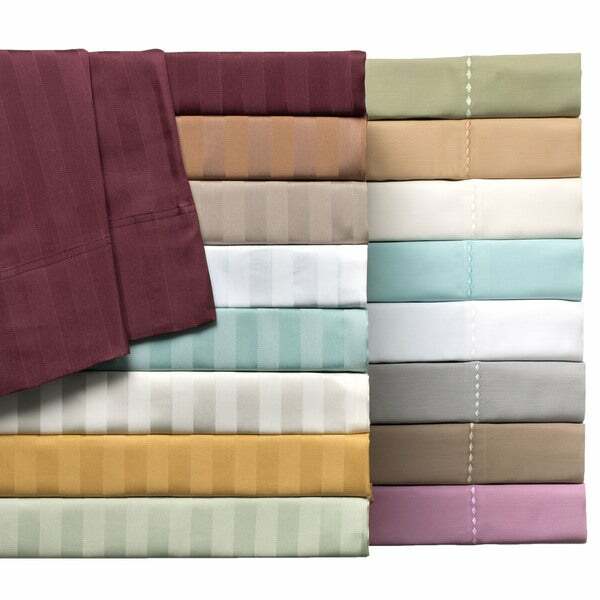 Enjoy a deep, peaceful slumber as you end the day with this cotton blend sheet set from Delray. Featuring a sateen weave, this 600-thread-count sheet set feels luxurious to the touch. Available in a variety of eye-catching colors, this sheet set brings vibrancy and flair to any space. The set comes with a matching flat sheet, fully elasticized fitted sheet and four pillowcases, lending a coherent look for your bedroom. These were purchased (2 sets) for a rarely used condo property. After rare usage and few washings, the fabric has pilled up in the positions of where a body would lie. Disappointed and in the process of replacing as I'm embarrassed by them. I purchased these sheets recently...most fitted sheets fit up too an 18" mattress...I hate a loose fitted sheet. These are PERFECT for a 15 inch mattress. Fits securely. The feel is luxury.............the flat sheet is the perfect for tucking in. Ive washed several times & they have come out each time better than before!! First the good. These sheets are soft, smooth and wash beautifully, coming out of the dryer with no wrinkles. Now the "but". There is something about the fabric that makes it difficult to manipulate to my comfort. If you like your bedding to remain in place as those who like covers tucked in under the mattress, you will love these sheets. You don't even have to tuck them under the mattress in order for them to stay put. And that is my problem with them. I am not one who likes to feel I am sleeping in an envelope. The first thing I do at a hotel is untuck the blanket and top sheets as I like to wrap myself cozily with my covers tucked around me, not the mattress....and retain the option of sticking my foot out if I choose. The top sheet in this set is nearly impossible to manipulate to my comfort. The part hanging down off the foot of the mattress stubbornly refuses to be pulled up around the "corner", clinging to the bottom sheet as though Velcroed in place. I actually have to go to the foot of the bed and physically lift up on that part of the sheet to free it from the cling. Ditto on the way it clings to my nightclothes when I turn over in bed, causing me to struggle to avoid being trapped in a twist of sheet and pjs. Bottom line...the sheets appear to be good quality and would probably be great for those people with whose sleep mode they are compatible. For me they don't work as well because of the constant competition between me and my sheet to determine who is boss. After 6 years, one of our two pairs of king sized sheets finally got a rip in them, in the fitted sheet. It was time to replace. Having purchased our initial two pairs from Overstock, I returned. I have to admit, I couldn't recall the brand and rather than go find it on our other still-fine sheets set, I chose these sheets for the thread count and large number of good reviews, which seemed like good criteria. I was away when they arrived and first saw them after my husband washed them and put them on the bed (early July). Immediately I could tell they were thinner than our other sheets and thinner than what I'd expected. I guess thread count doesn't also relate to thicker fibers. (I should have remembered this- I bought a twin set for my daughter many years ago, supposedly 1000 thread count, and they are rather thin, but they're still hanging in there, surprisingly). After less than a week, some of the threads at the top where the finished hem is were already coming loose. I highly doubt these sheets will last even half as long as our others. Disappointing, because even if they do last a while, the thin feel is just not as satisfying. I don't want to return them- probably possible but more difficult once washed- but mostly because I'd like to see how long they do last. Lesson learned- take the time to find out what brand/model worked well and buy the same or similar. I bought two sets of these sheets-plum and sage, I believe-and I am so happy I did. The colors are rich and the fabric is wonderfully silky. Plus, I know this is a little silly, but I adore the stripes on them. I never have a problem figuring out the fitted sheet when I change my sheets! Very nice sheets, have had them for some time. Still very nice and no rat tails or fringed seams. Great quality! who doesn't like soft sheets? so many colors to choose from that i found the color i needed in no time. very glad a made this purchase. A truly great buy. Soft material and when it comes out of the dryer, there are very few wrinkles. I loved the color choices and the bottom sheet fit super snuggly. I definitely will buy another set soon. Love these sheets, great price, comfortable to sleep in. Great choice of colors. Have been using these sheets for quite some time really are great. "Do you carry Dreamfit Sheets for tempurpedic king split mattress?" Hello cjjplay, we do not currently have Dreamfit sheets on our site. Thanks for shopping with us! "Could I buy 4 pillow cases?" Hello Ivochka, this sheet set includes four pillow cases. The pillowcases are not sold separately. We have similar pillowcases that can be found under item # 15459572 - Thank you for shopping with us! "One review said that the stripes on the king size bottom (fitted) sheet run in the opposite direction as the top sheet. Is this true?" Hello overstocklmb, the stripes run the same direction as the others do as well. Thank you for shopping with us. "This sheet set claims it is 6 pieces. Besides 2 sheets and 2 pillowcases, what adds up to 6 pieces?" Hello nylahtram, the set includes one flat sheet, one fitted sheet, and four pillowcases. Please let us know if you have additional questions. Thanks for shopping with us. "Just got them, seems rough, I want to wash them and see if they feel softer after the wash. Would I be able to return after I wash them, if not soft? Thanks,"
Hello workcoholic, we do apologize,items must be in new and unused condition for a full refund. Thank you for shopping with us. I have bought these sheets before, and they are the best sheets I have ever used. I even bought 4 sets for some of my family for last Christmas gifts. Have used this product mulitiple times and very satisfied. Have similar sheets on other beds and really liked them. "Hi scrolled over the sheet to see color but it doesn't say. I can't figure it out! I would like the gray/pewter-ish ones .Also, I have a queen bed--will full or king fit? I don't see a queen option"
Hello margaret, unfortunately, our queen size is out of stock. The dimensions for full size fitted sheets are 54 inches wide x 75 inches long, the flat sheet is 90 inches wide x 102 inches long and the pillowcase is 20 inches wide x 30 inches long. The dimensions for king size fitted sheets are 78 inches wide x 80 inches long, the flat sheet is 102 inches wide x 108 inches long and the pillowcase is 20 inches wide x 40 inches long. Hope this helps, thank you for shopping with us!